A simple business road trip turns eerily mystical and suspenseful after Margaret (Catherine Kellner), a freelance environmental photographer is granted her first important governmental assignment to visit Canadian toxic waste sites and use her high tech radiation equipment camera to assess toxicity levels. She journeys from New York with her good-natured but admittedly slacker-like ex-boyfriend Jay (Ebon Moss-Bachrach) and while at first one assumes that looking at toxic waste may serve as a metaphor for their ruined relationship, writer/director Leslie McCleave throws us for the first of several loops when unexplained events and circumstances befall our leads. Despite the thousands of miles traveled, the two are shocked to discover that the car is never in need of gas and Jay is confused by the fact that he spent his last twenty dollar bill yet it reappears inside his worn wallet, and they’re plagued by devices to the outside world that don’t seem to work right such as the static filled radio, pay phones that are always broken, and Margaret’s camera that won’t uplink her data so that its memory is filled quickly and she’s stuck just visiting sites without any means of recording her findings. Cerebral, strange yet compulsively addictive, the film begins like a typical estranged lovers on the road movie but evolves into an unexpected mysterious treat for film fans who love to solve puzzles and despite an unfortunately vague ending, we’re left trying to piece together the metaphors of our deteriorating environment, dependence on gas and money, etc. that all resonate subtly and methodically. 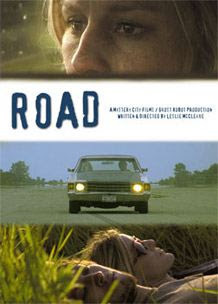 Chris Brokaw’s musical score to Road earned him the composer the Certificate of Excellence at the 2006 Brooklyn International Film Festival and the two stars (Kellner and Moss-Bachrach) won Outstanding Performance accolades at the 2005 Los Angeles Film Festival. Wonderfully clever little sleeper that sneaks up on you— McCleave’s film plays especially well at home on rainy days when you don’t exactly feel like going on the road.